I'm preparing a talk for the Pacific Astronomy and Telescope Show here in Pasadena on Sunday afternoon at 1:45. I have spent the morning putting together a slide that I have long wanted to have for presentations. It includes all the big stuff in the solar system (everything bigger than 400 km across, making Mimas the smallest thing on it) to scale, using nice images with approximately correct color and rotated so that they all appear to be lit from the same direction. This means that some of the bodies are sideways or upside down, but I don't have a problem with that because "sideways" and "upside down" are just arbitrary conventions anyway. One inaccuracy that I know about already: there are not enough trans-Neptunian objects to represent everything larger than 400 kilometers that's known to exist. Mike Brown recently posted a table listing more than 200 objects that probably or possibly are bigger than this -- there's a significant amount of uncertainty, of course, but statistically speaking it should be fairly representative. If I have time before my talk Sunday I'll have to add in more of those things! Anyway, I'm asking eagle-eyed readers to tell me if there's anything wrong here, either by email or in the comments. Once I've got a version that I'm pretty sure is accurate, I'll post it in nice high resolution so that others can use it in their own presentations. EDIT: Main inaccuracies pointed out so far are the order of Proteus and Triton. 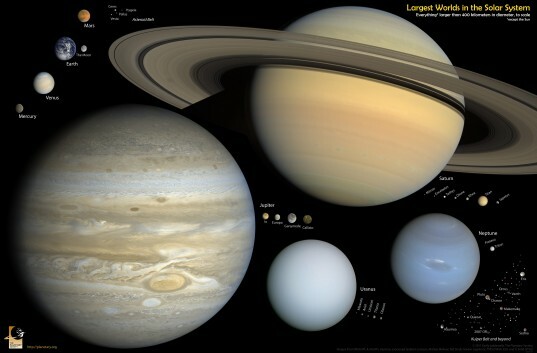 No, Jupiter isn't too small. Also, I initially said there were 45 objects probably bigger than 400 km in the Kuiper belt. That was out of date; it's more than 200 now.